San Antonio Spurs guard DeMar DeRozan (10) looks to pass over Denver Nuggets forward Torrey Craig (3) in the first quarter against the Denver Nuggets at Pepsi Center. 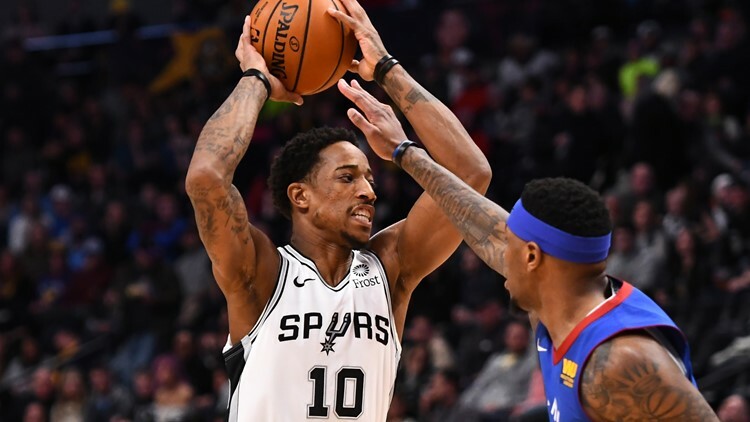 Jamal Murray scored 31 points, Monte Morris hit two big free throws with 7.2 seconds remaining and the Denver Nuggets held off the San Antonio Spurs 102-99 on Friday night to extend their home winning streak to eight. Nikola Jokic added 21 points, nine rebounds and nine assists before fouling out as the Nuggets nearly squandered an 18-point, first-half lead. Bryn Forbes had a 3-point look to tie the game in the final second but couldn't get it launched in time over Trey Lyles. San Antonio, the top free throw shooting team in the league, went 4 of 8 from the line over the final 1:48. LaMarcus Aldridge finished with 24 points. It was the second game of a home-and-home between the teams. The Spurs won 111-103 in San Antonio on Wednesday. The Nuggets remain percentage points ahead of Golden State for the top mark in the Western Conference despite missing starters Paul Millsap, Will Barton and Gary Harris due to injuries. Murray came up big before turning his right ankle in the fourth quarter. He was hobbling the rest of the game. Malik Beasley had 21 points, but also rolled his left ankle on a drive in the fourth quarter. He made two free throws before exiting. Jokic drew a crowd, but kept finding the open player. He fouled out with 1:33 left. DeMar DeRozan added 15 points. DeRozan and Aldridge combined for 57 points in the win Wednesday. The Spurs turned up the defense in the second half to climb back into the game. Trailing 100-98 with 28 seconds remaining, Derrick White made one of two free throws. Morris then was fouled on a drive to the basket and made both. Spurs: F/C Pau Gasol (right foot) made the trip with the team and is getting closer to a return. ... Coach Gregg Popovich called a timeout just 46 seconds into the game. Nuggets: Harris (right hip) and Millsap (fractured right big toe) are nearing a return. Coach Michael Malone and the Nuggets are borrowing a page straight out of the Spurs' playbook with this philosophy: Don't hold onto the ball. Malone wants his players to make a decision within a half-second. "If you're open, shoot it. If you're not open, get off the ball with a 0.5 (second) mentality," Malone explained. "That makes you and us as a team really hard to guard. Because the ball is going to move a hell of a lot quicker than the defense can." White grew up in the area and played a season at the University of Colorado. He's gone from sporadically playing for the Spurs last season - he also helped the Austin Spurs win the 2018 G League championship - to becoming their starting guard. "He's just a young man who's gaining confidence day by day," Popovich said. "Just believing he belongs is really the important thing for him." Spurs: Play in Los Angeles against the Clippers on Saturday. Nuggets: At Phoenix on Saturday. The Nuggets are 3-0 this season in the second game of a back-to-back this season.